Tool me once, shame on you. Tool me twice, shame on me! Race car or tool? In the eyes of long-time Hot Wheels resident hooligan Graphic Designer Wayne Scott, its both. The Tooligan ushered in a new design path for Wayne. From graphics to industrial design, Wayne designed this hodge-podge of tools into a track-worthy race car. But don’t think for a minute that in the creative mind of Wayne Scott, he was going to stop there. There more than what meets the eye as Wayne’s Tooligan is actually working tool with wheels. Most noticeably, this multi-purpose tool has a 3/8″ wrench as a spoiler. Flip this car over and there is a hole that fits a 1/4″ hex so you can put a flathead, phillips or a bore bit right in. Rounding it out, the nose of the car has a 1″ ruler graphic on it. There are a few non-working tools hidden in the design as well. You can see that there are pliers across the top of the vehicle, Phillips screwdrivers built-in as motors and wrenches on each of the sides. Check back often as we reveal other #Castings with “other” uses. Since its initial 3 colorways in 2010, the Tooligan has only appeared once since then and that was in the 2014 Flame Flights 5-Pack. This 2010 New Models release can be found online or at a local show relatively easy and for cheap. So the next time you find a Tooligan, just know that there is more than what meets the eye! 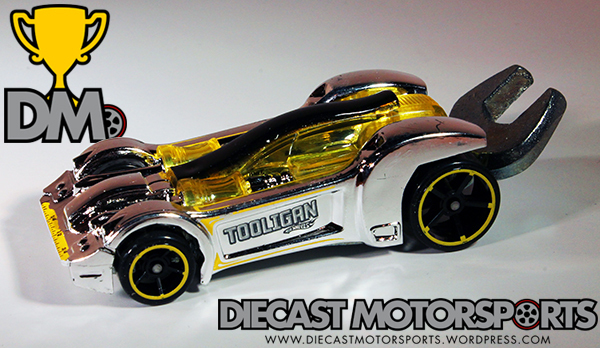 RELEASE DETAILS: Chrome Body (plastic). Yellow-Tinted Windows. Chrome Interior. Unpainted Metal Base. Made in Malaysia. Toy# R0917. Released in 2010 as part of the 2010 New Models Series.